I am excited by the quick professional service. Excellent Module fast to setup and Great customer service from all team. Fast responce and Professional Behavior. Communicate quickly and efficiently about your new products and product re-stocking via your Facebook page. Automate and save time while increasing your sales ! Also integrates with our Customer Ratings and Reviews Pro + Google Rich Snippets module (available on https://addons.prestashop.com/en/seo-natural-search-engine-optimization/6144-customer-ratings-and-reviews-pro-google-rich-snippets.html) so you can have the ratings and reviews from your PrestaShop website also posted on your Facebook page. Maintaining your Facebook page takes time … This module will not make you exempt from engaging and talking with your fans, but it will save you valuable time by automatically posting new product and restocking notifications. Automate, save time and increase your sales ! Moreover, the module "manual publication" on Facebook allows to communicate from any angle : whether your are announcing a special promotion, a private sale, pointing out a favorite product or simply putting a product, category or brand in the spotlight. The module will publish your custom text on your Facebook page and will automatically add the product, category or brand's name, link, description and photo. 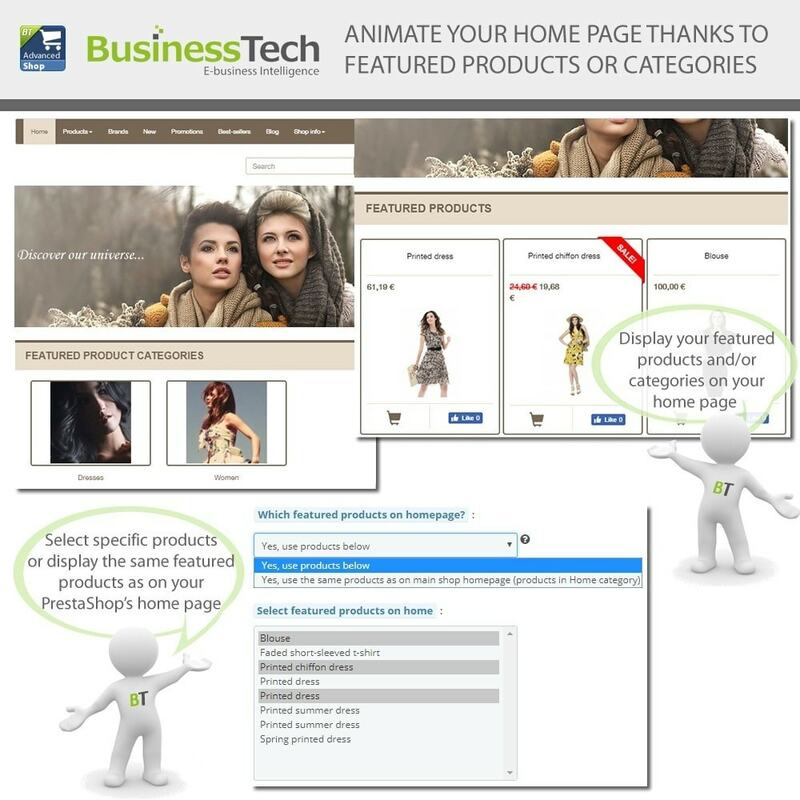 The link will bring directly visitors to your PrestaShop website. 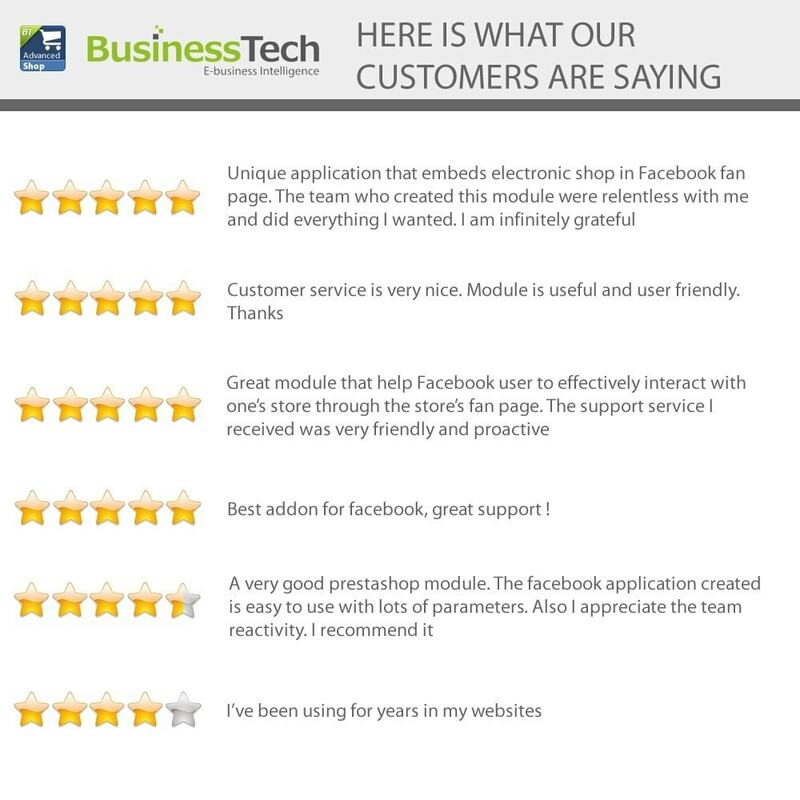 Finally, by combining this module with our Customer Ratings and Reviews Pro module (available on https://addons.prestashop.com/en/seo-natural-search-engine-optimization/6144-customer-ratings-and-reviews-pro-google-rich-snippets.html), display product ratings and reviews on your Facebook page (after moderation of course). Furthermore, at BusinessTech, we have a fast and efficient tech support : when you contact us, you are talking directly to the developers, so you are sure to be well informed! Automatic publication on your Facebook page wall of products that were out of stock and are being restocked when you update your stock quantity. It works much like the native "E-mail Alerts" PrestaShop module, but via Facebook. Product stock for products with combinations is handled properly. 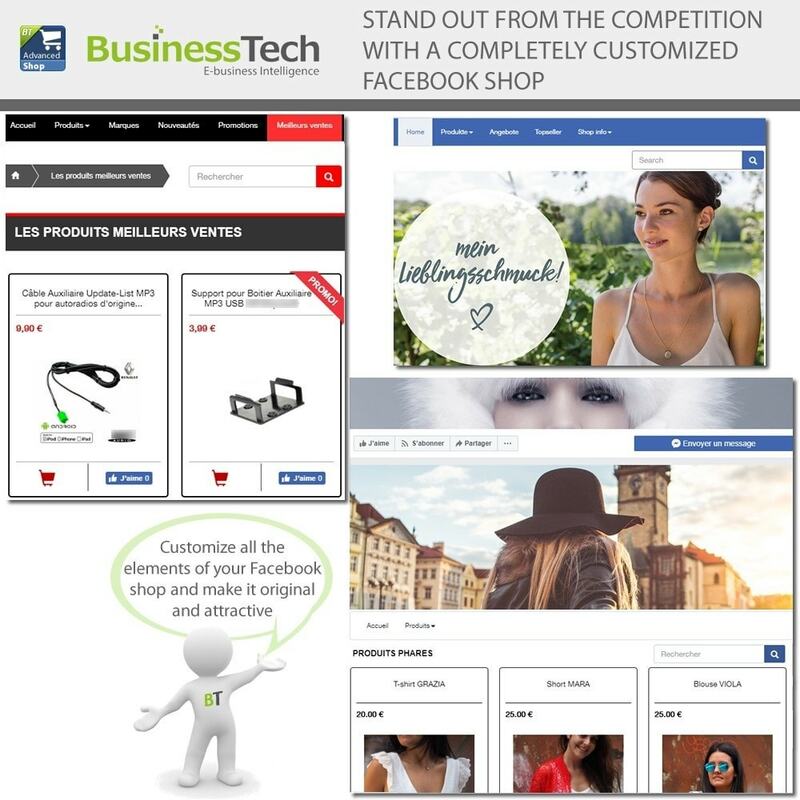 Manual publication of any product, product category or brand on your Facebook page wall, with free text for your status update. Great Modul! Installation and set up is little more advanced, but it is worth to buy it. If you are strugling with set up - they have fabolous support team ;-) HIGHLY REcommended! 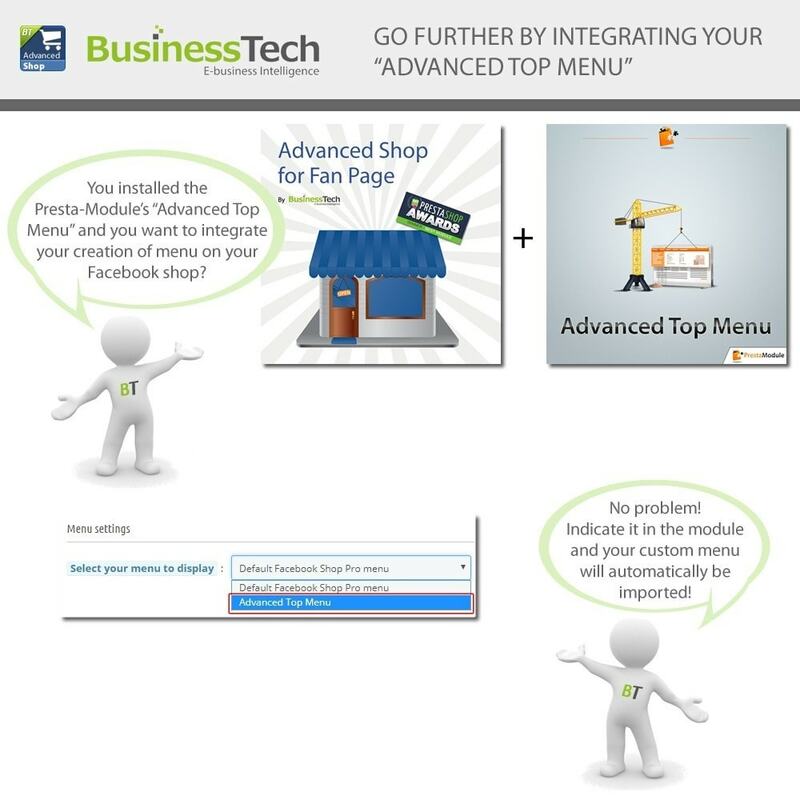 Your customers will appreciate being very easily informed of your new products and restocking updates via their Facebook account, by going to your page, or directly in their newsfeed if they are already fans. They will surely like your Facebook page originality, thanks to these different posts, and they will return it to you ! 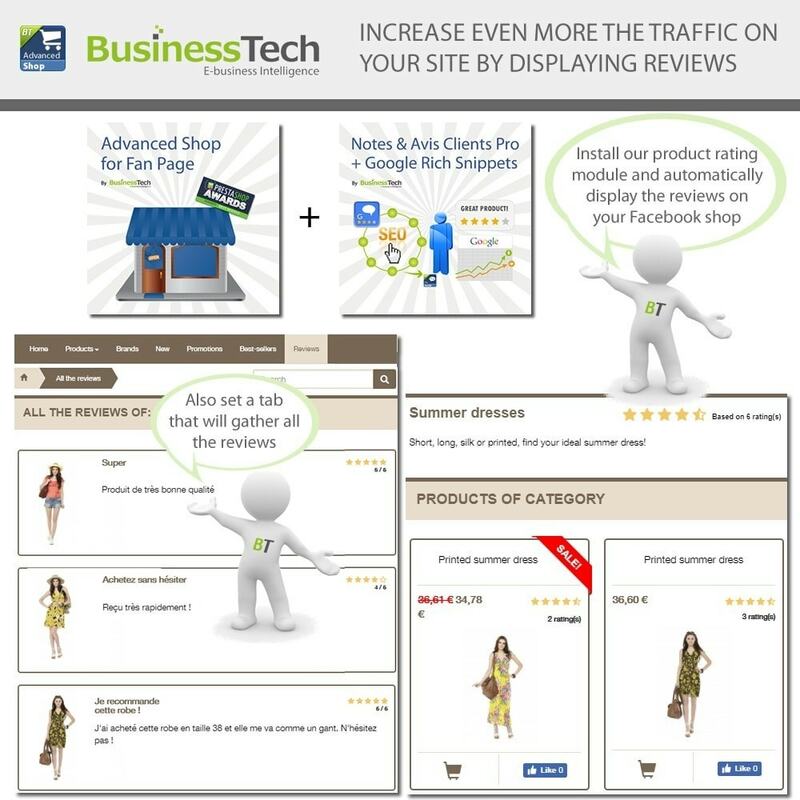 If you combine this module with our Customer Ratings and Reviews Pro module (available on https://addons.prestashop.com/en/seo-natural-search-engine-optimization/6144-customer-ratings-and-reviews-pro-google-rich-snippets.html), they will be able to read your product customer reviews and this will reassure them for their next purchases. Did you know that one of the main purchase obstacles on the Internet is to have to create a custom account? With "Social Login" module, boost your conversion rate by letting your customers easily register and log in to your shop through their favorite social network: Facebook, Paypal, Amazon, Google or Twitter. REDUCE YOUR ABANDONED CART RATE ! This is a known fact in the world of e-commerce that the less friction there is during checkout, the higher the chance is that the customer will finalize his or her order, considerably reducing cart abandonment. Social networks use has largely expanded and is experiencing unprecedented growth. Today there are more than 3 billion active social network users worldwide. Use this astounding craze to your advantage! 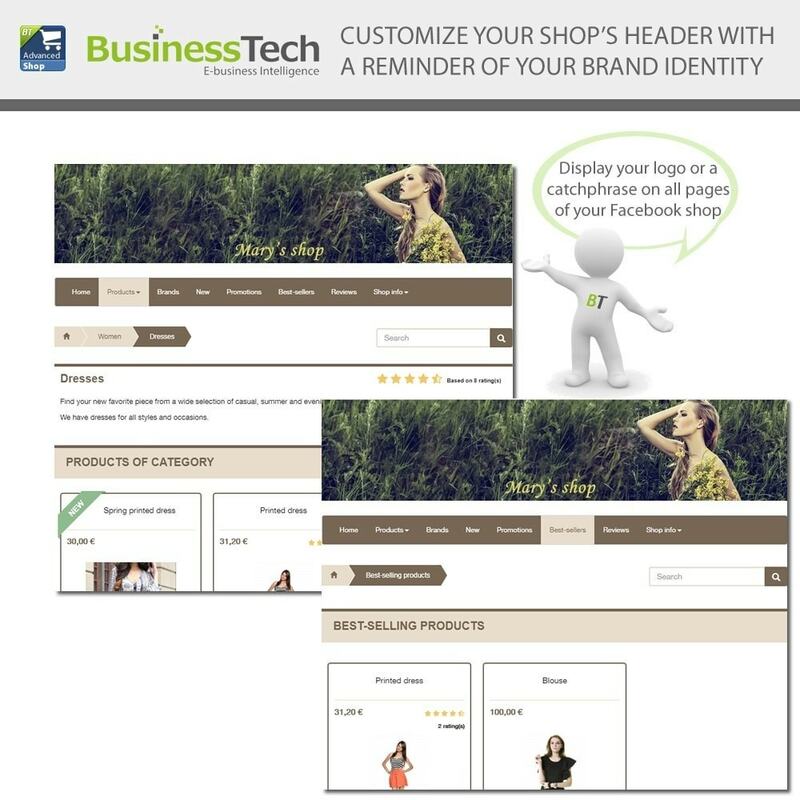 Thanks to the "Social Login" module, your customers will be able to register and log in to your shop in only 1 click.They'll just have to connect to their favorite social network, as Facebook, Paypal, Amazon, Google or Twitter. This will make the ordering process much quicker and easier. Moreover, with PayPal, it's a real 1 click registration because PayPal also automatically fills the customer's shipping/billing address in the customer's account. But it's not all! If you have a 1.7 PrestaShop version, you can go even further linking this module with the Presta-Module's "One Click Order" one (available separately here: https://addons.prestashop.com/en/express-checkout-process/29273-one-click-order.html) and offering to your customers not only to log in 1 click but also to order in 1 click! Placing an order on your site has never been easier! 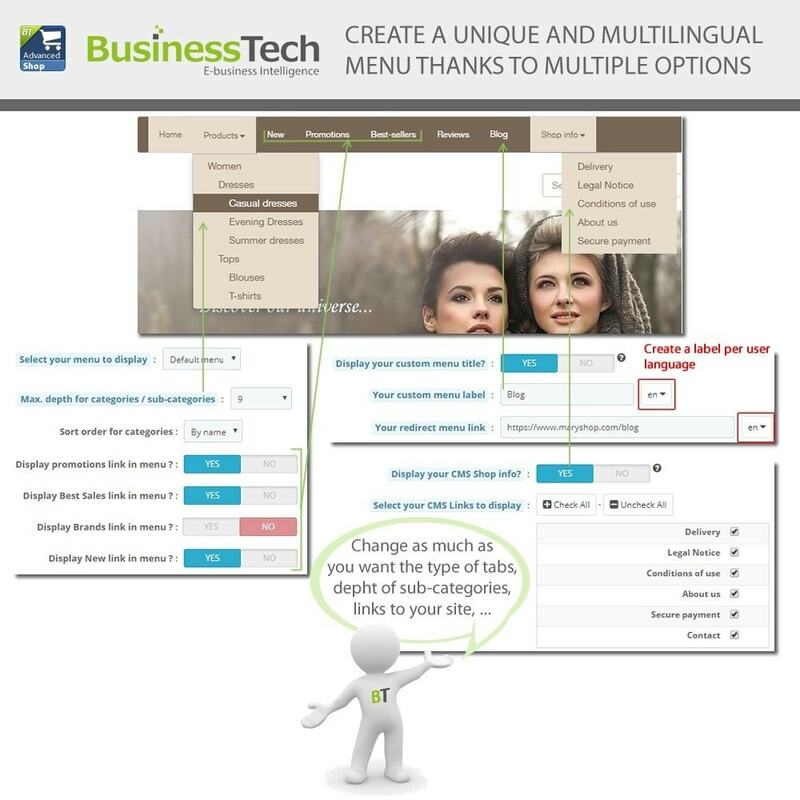 - HTML elements use: select the HTML element on which you want to see the buttons, fill it in the back office and the module takes care of everything! - Shortcode use: for pro, only fill out a configuration form and get the shortcode to insert directly in your theme template. Whether you choose a classic or an advanced position for your connectors, the module offers you a complete CSS tool that allows you to fully customize the appearance of the connection block. Take advantage of this advanced feature to make your shop visually unique! This state-of-the-art "Social Login" module was implemented with the latest standards of Facebook, PayPal, Amazon, Google and Twitter, insuring a high level of quality and robustness. We have completely rebuilt the interface of the module to make its configuration as pleasant and intuitive as possible. Finally, we have also reworked the design of the connection buttons to allow you to opt for a style of buttons much more modern than before. You have the opportunity to give a resolutely current style to your shop. You want to attract new customers? What better than to offer a voucher in exchange for a quick connection through their favorite social network? They will not only waste time filling out a registration form but in addition they will take advantage of a voucher. Ordering will be greatly facilitated! The module gives you the possibility to highlight, or not, this offer in different positions on your website and to fully configure its application conditions directly from the module's back office. The module lets you choose as many connectors as you want among the 5 available (Facebook, PayPal, Amazon, Google, Twitter) and set them up, in the order you want, at different locations on your website. If default positions do not suit you, we give you a tool allowing you to precisely indicate to the module on which HTML element you want the connectors to appear. After configuring this new custom position, the module will display the connectors at the desired location. Finally, if you want to be completely free to position your connectors exactly where you want, the module gives you the ability to generate directly, according to your criteria, the piece of code (shortcode) to insert into the template of your theme. Whichever method you use to place your connectors, you have a complete CSS tool to fully and independently customize each connection block that is on your site. 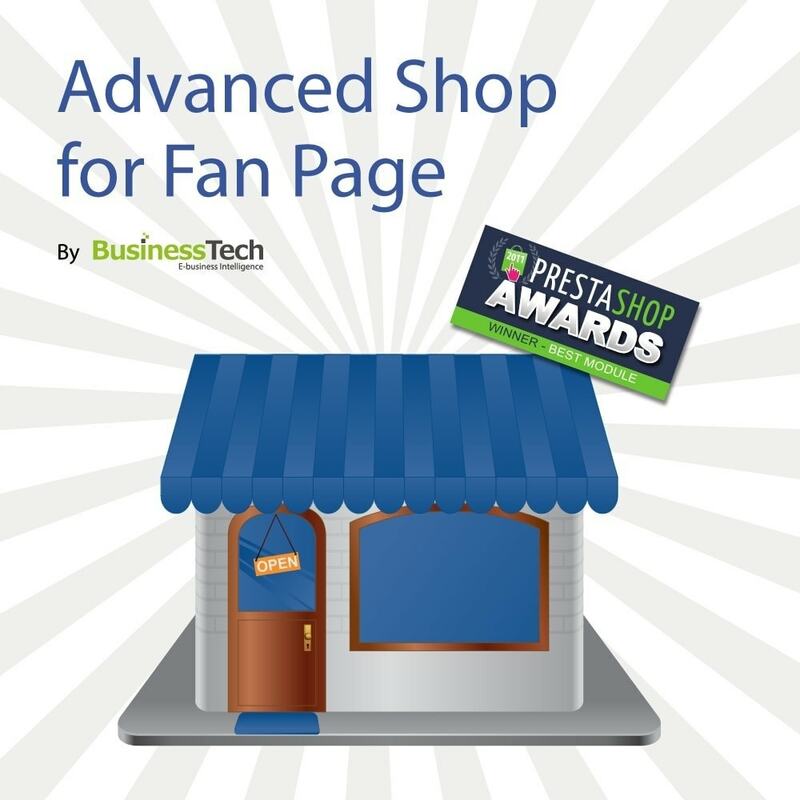 For PrestaShop 1.7 version users, the "Social Login" module perfectly integrates with the "One Click Order" module of Presta-Module (available here: https://addons.prestashop.com/en/express-checkout-process/29273-one-click-order.html). 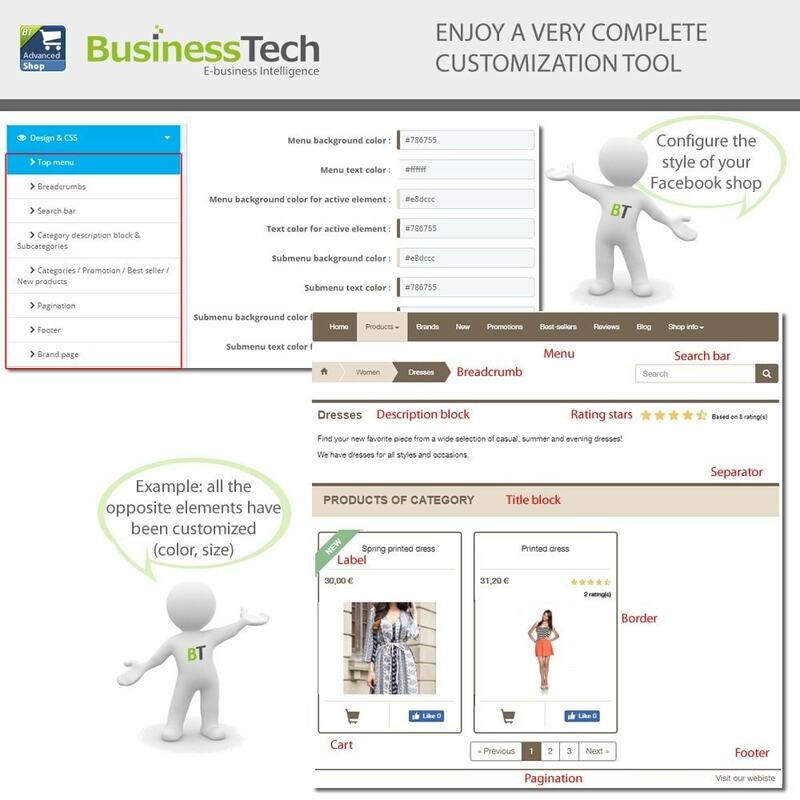 By combining the two you will have THE perfect combination to boost your sales: your customers will not only log in to your site in 1 click but also place an order in 1 click. 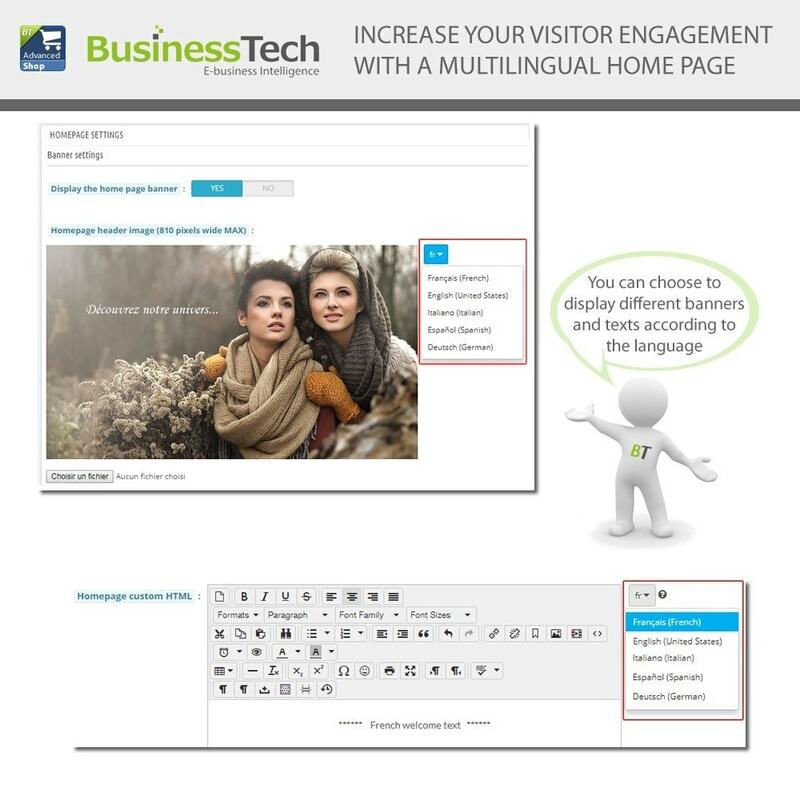 Your conversion rate will be greatly improved. so nice !!!!!!!!! perfect ! thank you ! Facebook or other social networks login is now widespread and implemented by major websites and online shops. 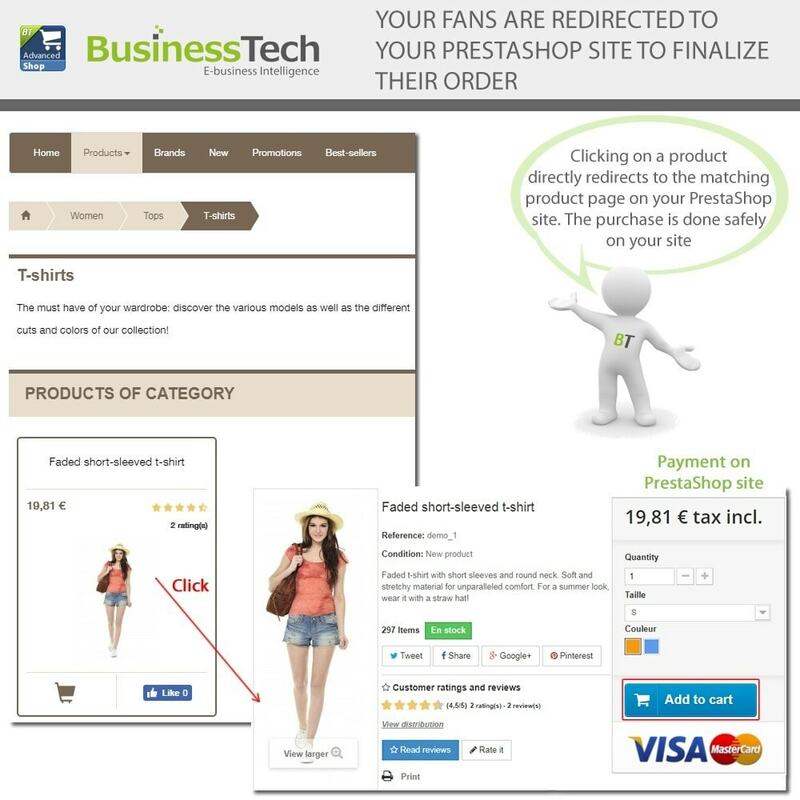 Your customers will appreciate this fast and convenient login method and will be more likely to finalize their order. If also you offer them a discount voucher in exchange for their connection through a social network, they will be more than seduced! Excellent pack. A great purchase for anyone who wants to get a good start promoting their products on Facebook. At the beginner I have had some problem with my hosting configuration but the Businesstech has help to me a lot to be able to install and set up the module. Very easy, friendly and up-to-date. Just make sure you follow the instructions TO THE LETTER! The new Facebook authentication uses and requires the PHP CURL extension. Most web hosts support it, but if in doubt, contact your host before purchasing this module.